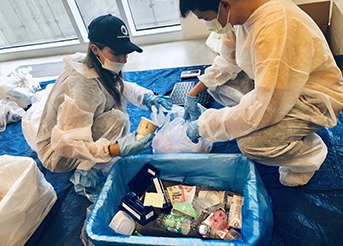 In late October, Yale Health and the Yale Office of Sustainability partnered to host a waste audit, themed “Ghoulish Garbage” in keeping with Halloween festivities. The event demonstrated current opportunities to improve waste management in the Yale Health building while providing a space for questions and feedback from staff members. Many clinical and administrative staff offered enthusiastic suggestions for improvement. Waste audits on campus are typically organized by the Office of Sustainability through their Sustainability Service Corps (SSC) program, which employs undergraduate students. Prior to conducting an audit, building services staff set aside trash and recycling from key areas in the building of interest. During the audit, SSC students dressed in protective suits and gloves sort through the bags and redistribute waste properly. Bags are weighed before and after redistribution as a means of quantitative assessment. When held as public events, waste audits can serve to create more visibility around issues of waste management. At Yale Health, the waste audit was performed in the morning so that staff could stop by at the beginning of the day or during a morning break. In addition to watching the audit, attendees had a chance to provide feedback on items of confusion, watch short informational videos, and use the RecycleCT widget to learn more about proper recycling habits while enjoying coffee and donuts. The audit resulted in some useful insights about waste management at the Yale Health building. For example, among two bags of trash that were assessed, one contained nearly 21% recyclable material and the other nearly 17% recyclable material (by weight). Recyclable items found in the trash included plastic cups, soup cans and a paper sleeve for coffee cup. This demonstrated that there is potential for improvement in waste management and recycling practices. Recycling was littered with paper towels and tissues, paper products that cannot be processed with single stream recycling. Yale Health is working to improve a 15% rate of waste diversion and joins other departments across campus to move the University toward its 60% diversion goal. According to the organization Practice Greenhealth, U.S. healthcare facilities create upwards of 14,000 tons of waste every day. Twenty-five percent of this waste is plastic packaging, and 75% or more is not biohazard waste. The Ghoulish Garbage Waste Audit and its related efforts are part of a larger push to build community and improve sustainable practices at Yale Health, in keeping with the broader goals set forth by the university in the Yale Sustainability Plan 2025. The efforts at Yale Health seek to create more sustainable solutions to everyday challenges with consideration for the unique features of the clinical spaces and the needs of the staff and patients. Yale is committed to building a more sustainable world. By doing what we do best—integrating science, the humanities, and our community—Yale creates, tests and adopts innovative solutions to the environmental and social challenges we all face.